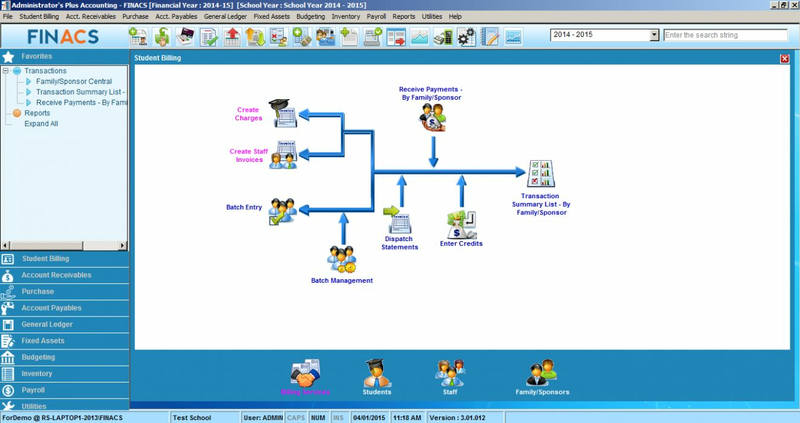 FINACS/AP Accounting is Rediker Software's complete fund accounting software program for schools, offering unsurpassed integration of student demographic information and financial information. 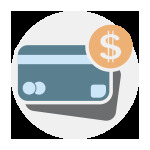 Parents can view and pay invoices online via credit card or bank account. Up-to-date, school-wide financial information for public or private schools anywhere in the world. Dual-currency capability perfect for international schools. 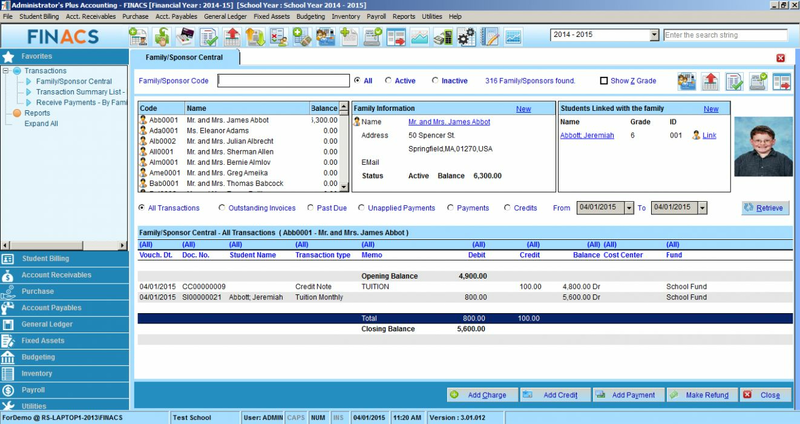 Student information automatically appears in the accounting program, eliminating duplicate data entry. 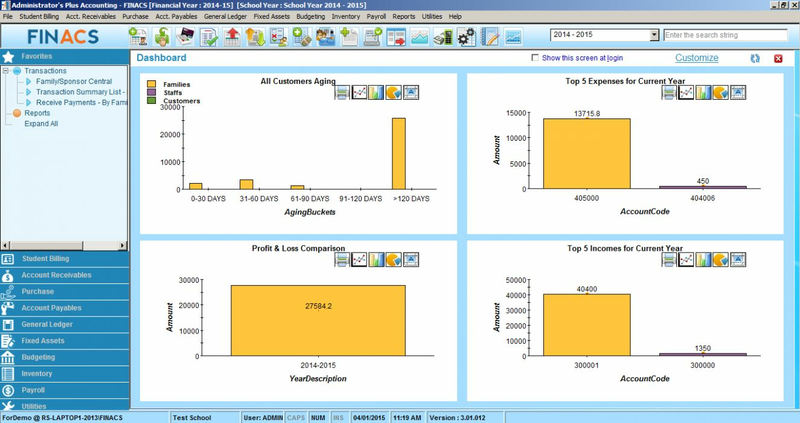 Quick access dashboard: Easily view statistical data, create and customize graphs, and choose from the Data Source list. Family/Sponsor Central: View family information at a glance. Users can create charges, add credit, make payments, and issue refunds. ACH payments: Instantly generate a NACHA file. Each record can be modified to the specifications of your bank. Billing services: Recurring billing codes can contain different charge amounts, or point to a different ledger account. Billing codes can also be copied and then modified with new codes and details. Digital portfolio: Attach external files and additional comments to any transaction. Flexible chart of accounts: Import your existing chart of accounts or a downloaded standard (like the UCA), or use our default standard. Fund/Cost center accounting: Define your own funds and cost centers to keep better track of your income and expenditures. 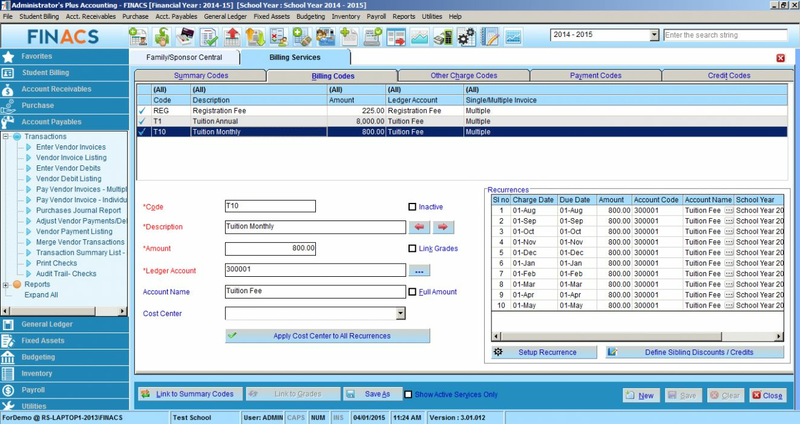 The Administrator’s Plus Accounting solution (FINACS) includes the student billing module APA Student Billing. This module is available as a stand-alone software program and integrates seamlessly with Administrator’s Plus. When the time is right, upgrade to our full FINACS/AP Accounting software package for a total accounting solution designed just for schools. Powerful batch entry features: Apply charges to entire groups of students that meet your criteria in one step. Batch payments to multiple families. Split invoices between parents/guardians or sponsors. Flexible definition of charges: Easily tailor tuition payment plans to suit your needs. 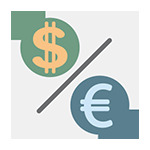 Dual-currency support: Work with the student's preferred currency. Online bill payments: Parents can use Online Forms to view invoices and securely submit payments online. You can also import payments directly from FACTS and SMART. 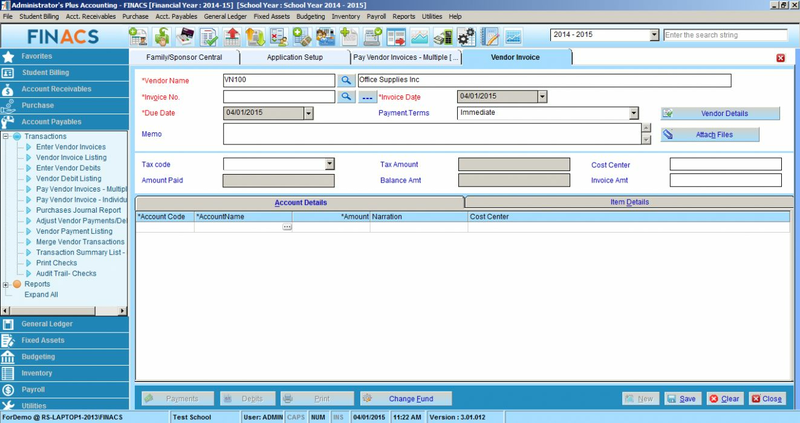 Once a payment is made, the Administrator's Plus billing module is updated automatically. Customer invoices: Invoice charges not related to a student’s account. Aging: Categorize accounts by days outstanding. Apply single payments to multiple charges. 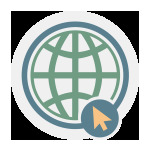 Receive payments online through Online Bill Payments or import payments directly from FACTS and SMART. Create, track and approve requisitions through pre-determined approval levels. Customizable check printing: Use the drag-and-drop tool to easily design the layout of your checks. Batch print checks to save time. Create budgets based on previous year actual or budget. Controlled expenditure lock prevents purchases exceeding department budgets. Generates an encumbrance upon creating a purchase order. “Drill-down” and “Roll up”: Annual budget can be viewed or reported in as much detail as you need. Allocate budgets to departments by dollar amounts or percentages of full budget. Compare current year income and expenses against previous budgets. 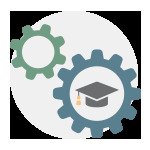 Keep tuition payments on track by generating timely reports of overdue accounts. FINACS includes dozens of ready-made reports that can be emailed directly to end users. Ready to get started with Rediker Software's integrated school accounting software? Fill in the fields below and a dedicated Rediker Software representative will get in contact with you. I have used Rediker Software's Administrator's Plus since 1994 and have found the company to be very supportive of their programs. In 2006 we implemented the AP Accounting program. The transition from our previous accounting software was very easy. AP Accounting has helped me through two audits by providing the necessary data and has made my financial reporting easier.